Set on a 5 acre site in an Area of Outstanding Natural Beauty, Silver Strand House is located 12km from Louisburgh in County Mayo. 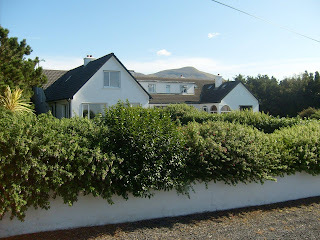 Overlooking one of Europe’s finest beaches, with views of Connemara and the islands, with Mweelrea Mountain in the background, Silver Strand House is ideal for people who prefer a more individual and independent lifestyle. This unique holiday home features eight bedrooms, seven showers, a sauna, two bathrooms, three televisions, two videos, a dvd player, complimentary broadband internet access and even bathrobes and hairdryers. This holiday home has no equal in the west of Ireland. Ideal for a break with friends or a family reunion, it offers spectacular views and a unique location close to miles of deserted beaches.